Just after Detroit developers and community leaders Tom and Peggy Brennan purchased the El Moore building in 2010, their associate Jason Peet happened to notice a nearby road crew throwing old curbstones into dump trucks. Peet didn’t know exactly what he’d do with the stones, but he knew he could do something. He approached the crew’s boss, and they struck a deal—$100 worth of pizza in exchange for delivering the curbstones down the street instead of dropping them at a landfill. As it turned out, some of the curbstones were a distinctive brownish-pink hue, just like the Lake Superior sandstone that covers the El Moore’s 1898 exterior. They’d been laid before 1910, which meant they probably came from some of the same northern Michigan or Upper Peninsula quarries as the Romanesque Revival building’s stones. Peet and the Brennans ended up using them to build the columns that now grace the El Moore’s driveway and gate entrances. “We never could’ve had these pillars that matched the building so well if we didn’t have those curbs,” says Peet, the building’s manager. The episode encapsulates the Brennans’ serendipitous, community-oriented experience converting the turreted structure into its current incarnation, a combination of 12 private residences and 11 hotel rooms, including four added rooftop “cabins.” Tom Brennan is a retired management consultant, and in 2008 he and Peggy, both native Michiganders, started the Green Garage, a sustainable business incubator housed in a former Model T showroom in Detroit’s Midtown neighborhood. “We’re trying to help jump-start Detroit’s economy,” Peggy explains. The Green Garage currently houses 55 small, local businesses. It has also established the couple’s reputation for a commitment to sustainability and a creative streak when it comes to repurposing old materials. The latter turned out to be a handy skill for rehabbing the El Moore, which is located on Alexandrine Street, less than a half mile from the Green Garage. The only way to salvage many of the building’s existing components—far removed from their original uses after decades of remodeling, decline, and neglect—was to think creatively. Owners Peggy and Tom Brennan. 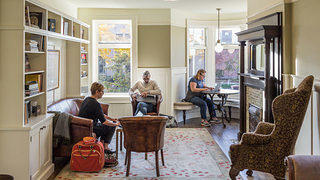 Residents and guests gather in the El Moore’s front parlor, which still has its hardwood floors from 1898. The El Moore contained eight luxury apartments—unusual for a neighborhood then dominated by large single-family houses. Also unusual was the building’s power setup: From the start, it was equipped with fully wired lighting and electrical outlets, features that had only been showing up in Detroit houses for a few years before the El Moore was built, says Peet. Because people were still suspicious about the new technology, many lights also had gas pipes built in, just in case residents needed to revert to gas lamps. This luxe life didn’t last long, though. By the early 20th century, Detroit was a rapidly industrializing city, with a population growing just as fast. The El Moore’s history at this point is patchy, but Peet and the Brennans researched it as thoroughly as they could, cross-referencing the address with lists of city dwellers so they could guess how many residents the building had at different points. “We believe it was divided into a boarding-house of at least 38 units,” Peet says. “We know that as the city expanded, the neighborhood went from being a high-end residential area on the outskirts to becoming the center of a city that was doubling in size every decade.” It’s unclear when Moore’s ownership of the building ended, and it appears that the El Moore became vacant sometime in the 1990s. By the time the Brennans entered the picture, there were large holes in the roof. In the original main entrance, marble wall panels had fallen and shattered. Scavengers carted off the antique fireplaces, which fetch big money on the resale market. Before the economic crash of 2008, the building had been slated for a condominium and retail development, but that project never got off the ground. Finally, it went into foreclosure—and so did the bank that foreclosed on it. Ultimately the El Moore landed under the control of the Federal Deposit Insurance Corporation (FDIC). Watching the building sit vacant, Susan Mosey, executive director of the planning and development organization Midtown Detroit, feared it would go to auction as a foreclosed FDIC asset. So she called the Brennans. The Brennans and their team saw the building’s significance to the neighborhood, both as a piece of history and as a symbol of Detroit’s larger trauma of abandoned buildings, empty lots, and dilapidated architecture. Alexandrine Street, Peet says, was the last Midtown street heading south from busy Warren Avenue that still had at least 50 percent of its building stock. Were the El Moore to be demolished, the “first” house would be almost halfway down the block. 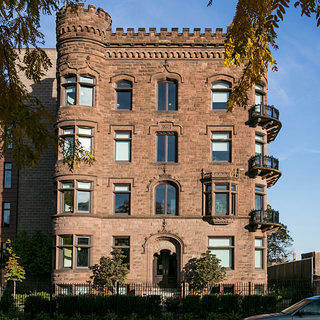 Or, the building—with its roughly 16,000 square feet, crenellated design, and architectural history—could undergo yet another makeover and serve as a stabilizer. “This building makes the whole block work,” Peet says. El Moore resident Harriet Green on her balcony. The new greenhouse and the El Moore’s rear addition. Lake Superior sandstone gives the building its brownish-pink color. The Brennans wanted to create a place that would contribute to the community. So they came up with the idea of a combination of apartments and hotel rooms, adding the rooftop cabins to make the whole project economically viable. “Existing buildings, I think they all have a nature. 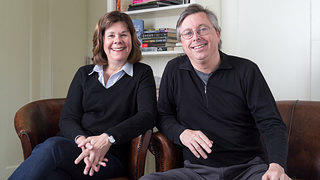 I almost feel like they’re living beings,” Tom Brennan says. “You just have to get to know them a bit and figure out what the possibilities are for the future.” The dual setup would create an interactive community experience, where visitors could meet residents and spend time in a Detroit neighborhood. Luckily, the front of the building was in mostly good shape. (The front steps, too worn and thin to remain in service, were replaced with new, neutrally colored sandstone that would complement the rest of the stonework.) Because of the Green Garage, people knew about the Brennans and their commitment to the community, and the renovation became something of a crowdsourced project. A local stonemason, for instance, had salvaged chunks of sandstone from a demolished church nearby. He kept them in his backyard until the El Moore project came up, and they ended up forming the replacements for the building’s missing balcony corbels. Likewise, a friend of the Brennans owned some of the original iron railings, which had been auctioned off years before. 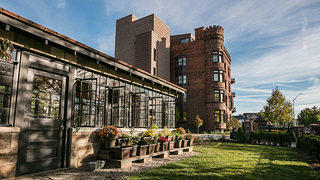 The El Moore team hired Detroit blacksmithing outfit Smith Shop to replicate them, resulting in seamless balconies made of both old and new materials. At a meeting of the Detroit Historic District Commission, the Brennans met a man who was replacing his old tiled roof. The tiles ended up on top of the new greenhouse they built to fill in the gap between the El Moore and the next building on the street. A large water tower that used to grace an old Cadillac dealership lives on, too: The body of the tank will be turned into an arched park entrance, and the legs became the supports for El Moore residents’ back decks and an exterior stairwell. 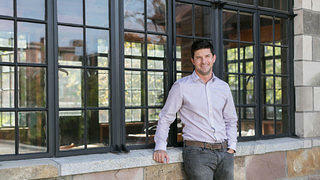 In planning new additions, local designer Woody Melcher respected the property’s historic spirit. A slim elevator tower and main entrance are set back to let the existing building stand out, and their minimalist modern design makes it clear that they are new. The greenhouse consists mostly of old, salvaged materials. And, because the El Moore is in a historic district, the added rooftop cabins are positioned so they can’t be seen from Alexandrine Street. Inside, the team had a unique solution for the El Moore’s disrepair. 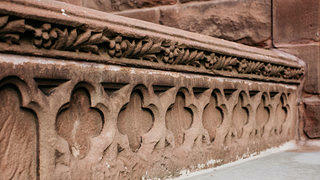 For missing architectural features, they took what scraps they could salvage to create one historical composite. All the usable baseboards and window trim have been consolidated in the first-floor parlor. Out of 16 original fireplaces, the crew found only scattered parts, but used them to make the parlor’s fireplace. 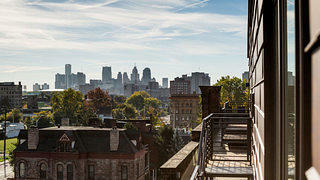 From the rooftop of the El Moore, a view of downtown Detroit. 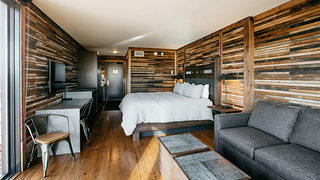 Inside a newly added rooftop cabin, built with salvaged materials. 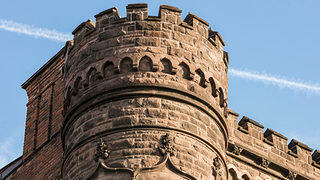 A closer look at the building’s dramatic turret. Apartment dwellers also work in the hotel, which has been a perk for resident Harriet Green, a retiree who staffs the welcome desk. In her time at the El Moore, she’s met people from 27 countries and 38 states. 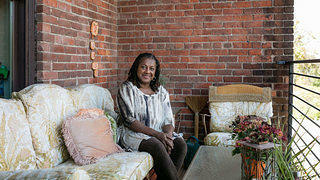 “The people who live here have created a community that is great to come home to,” she says. The El Moore helps that sense of community extend into the city, as well. There is no hotel bar, restaurant, or room service, although there is a continental breakfast for both guests and residents in the front parlor each morning. The idea is to encourage visitors to explore the neighborhood and the city more broadly by patronizing outside establishments.